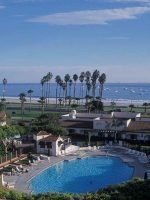 Four Seasons Resort The Biltmore Santa Barbara has an illustrious, 100-plus year history under multiple names, with a variety of owners and managers. 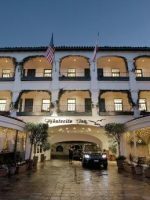 Four Seasons Hotels and Resorts acquired the property in 1987 and two years later, completed an extensive $19-million dollar restoration that created a lighter, airy ambiance, while preserving the original Spanish Colonial architecture that remains today. In 2000, Ty Warner, creator of Beanie Babies, purchased the property from the investment firm that had owned it, kept Four Seasons as its manager, and has since invested $305 million dollars in renovations to the main resort and Coral Casino Beach Club, completed in 2007 and 2008, respectively. In addition, a recent soft goods renovation included the installation of new custom Four Seasons beds. Today, the resort still has its casually elegant vibe, and is kid-friendly, too, with spacious rooms, a unique pool with a diving board and wading pool, and an array of activities from croquet and dance parties to S’mores nights and pool games, perfect for families. 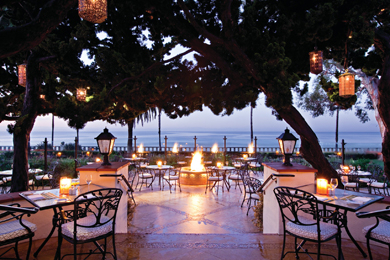 Though Four Seasons The Biltmore Santa Barbara is not technically in Santa Barbara, this 20-acre stretch of coastal property is about three miles south of Santa Barbara’s pier and many restaurants, and only a five- to 10-minute walk from boutiques and cafes in the unpretentious community of Montecito. Each of the 207 Spanish colonial rooms is decorated in rich golds, greens and blues, with elegant wood furnishings, comfortable upholstered chairs (many with ottomans), and gorgeous Spanish tile in the bathrooms and even on furniture tops. But the decor is not the only highlight. Four Seasons' innovative new mattress system, developed in partnership with Simmons, enables each guest to personalize his or her mattress with three different toppers that can be changed in minutes, for a feel that ranges from plush to firm. In addition, the beds have a "Gel Touch Foam Center" to absorb extra heat and increase comfort (which works especially well for pregnant women and women of a certain age). Add to that the down duvets and pillows -- hypoallergenic available upon request -- and you can see how good sleep can be a vacation highlight. 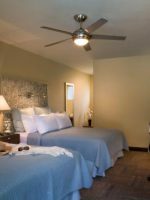 In addition, all rooms come with a CD and DVD player, clock radio, thick terry cloth robes, ionic hairdryers, refrigerated mini-bar, in-room safe, twice-daily housekeeping, complimentary Wi-Fi and national newspaper selection. Cribs and rollaway beds for kids age 18 and younger are free, however, extra beds are not permissible in two double bed rooms. These 350-square-foot rooms have one king or two double beds, a full Spanish tile bathroom with a rain shower, comfortable club chair seating, and a view of the gardens or courtyard. Located throughout the resort, these 350- to 450-square-foot-rooms have one king bed, and potentially a pool view, in addition to garden and courtyard view options. All categories from here up include complimentary access to the pool and amenities at Coral Casino Beach and Cabana Club Pool. In addition, these spacious 450- to 550-square-foot rooms feature one king or two double beds, a seating area for two, a separate tub and shower, and some have fireplaces. Located throughout the resort and with a variety of views, the Grand Premier runs the same size, but with a king bed, a sofa bed, and the ability to add a crib. Located in the main building and with ocean views, these 550- to 650-square-foot rooms have a fireplace, as well as one king bed and the ability to add a rollaway or crib. Also located in the main building on the first and second floors, but with garden views, these 600-square-foot suites, while large, have one king bed and the ability to add either a rollaway or a crib. Located throughout the resort with garden and courtyard views, these 700-square-foot suites have one full bathroom and one guest powder room, in addition to one king bed and the ability to fit a rollaway and a crib. The Deluxe version of these suites offers more space (900-square-feet) and a queen sofa bed. There are six additional, one-bedroom suites that range in size from 850 to 1,400 square feet. Each has its own unique decor and features, from a second floor balcony overlooking the pool to elegant dining tables for six and two with a secluded outdoor patio with a fireplace. 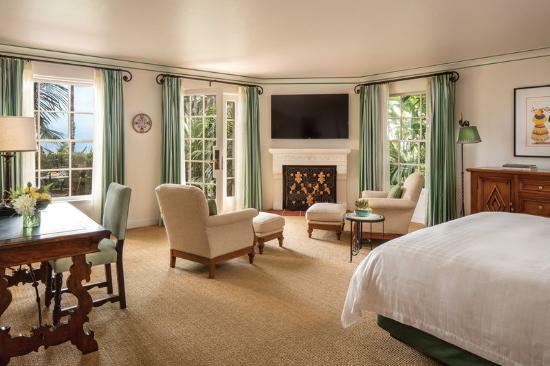 This 2,000-square-foot "cottage," named for the hotel's current owner, has three bedrooms, each with its own luxurious bathroom and in-room sitting area, and two have their own large patio. 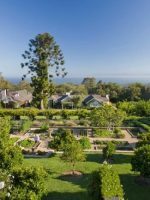 In addition, there's a parlor, fireplace, kitchen, dining table for eight, and another outdoor dining table on the main patio that faces the Monte Vista lawn. ADA compliant rooms are available, and connecting rooms can be guaranteed in advance. Four Seasons gone down hill, way down! great spot, great gardens, nice beach views! However, the food and beverage situation is sub par. My local diner serves better food overall, and the bartender at the pool area cannot mix a drink properly..I ran across a man who lives in the Santa Barbara area, and told me he and his friends have complained for years to the management regarding the poor standards in the food and beverage arena..
greasy flattened potatoes which could only be bested by Mcdonald's..for the money being charged, it was an insult to say the least and always left you wondering if you should wine and dine off premises. We visited the bar area two nights and enjoyed the atmosphere however; I think the majority was from our large party. We ate lunch and breakfast in the same area on three different occasions and again the service was great as was the food. For lunch, I enjoyed the fish tacos. The larger pool area is located in the Casino (that's only the name)across from the hotel, beach side. The pool was beautiful. There is a second pool closer to the check in but it is much smaller. The hotel has a Spanish decor with it's tile and brick. I would definitely stay here again when visiting Santa Barbara. This complimentary children's program is open 9 a.m. to 4 p.m. Memorial Day through Labor Day, as well as during the winter and spring break holidays, and Saturdays year-round. 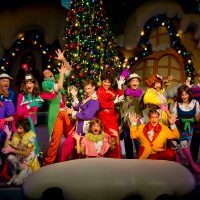 The supervised program is operated from a room stocked with toys, costumes, books, and beanbag chairs shaped like soccer balls and footballs. Daily themed activities draw inspiration from pirates, space and dance parties, with a little educational bent. Kids can participate for a full day or just a couple hours. For example, there's pizza making Saturdays at noon, a treasure hunt Mondays at 10 a.m., jungle-style obstacle course Tuesdays at 10 a.m., and even a "create your own herb infused olive oil" in the resort's herb garden on Sundays at 10 a.m. Reservations are encouraged and lunch is available for full day attendees (billed to your room). Pool Olympics are held on summer holiday weekends and a fantastic S'mores Night is available Tuesday, Thursday and Saturday nights from 7 to 9 p.m. in July and August. Silver bowls full of S'mores ingredients and long roasting sticks for the fire are set out in the garden. The Resort Jungle Pool is surrounded by lush landscaping, Kentia palms and Australian tree ferns, and tucked amidst the guestroom buildings. Kids love discovering that this hand-tiled heated pool pipes in underwater music. The wide entrance staircase on one end gives parents with toddlers a shallow spot to hang out and the pool depth ranges from 3 to 5 feet. Two large whirlpools near the pool are 3.5 feet deep, each with a bench around the circumference. The Jungle Pool is open from 6 a.m. to 10 p.m. daily. We saw a few toddlers in the cooler of the two whirlpools, however, if you want a fun wading pool where kids can play for hours, head to Coral Casino club. The Coral Casino Beach and Cabana Club Pool is located across the street and is a membership-based facility open to local residents, and is complimentary for guests booked in Premier Category rooms and higher. For guests in Superior or Deluxe room categories, access to the Cabana Casino Beach and Cabana Club Pool will cost $200 per day. Tip: If you want to spend an entire day poolside, just purchase the pass once and take full advantage of the club's amenities. Here, you'll find one of the largest hotel swimming pools in the world, at more than 160 feet long. Heated year-round, the pool has dedicated lap lanes, with an area for free swim and a diving board area supervised by a lifeguard. Depths range from 3.5 to 12.5 feet. Cushy lounge chairs surround the pool, offering views of the Pacific Ocean and Channel Islands in the distance, as well as the adjacent Coral Cafe, the place for casual poolside dining. In addition to the main pool, there is an oversized whirlpool, a large children's wading pool, a private staircase for access to Butterfly Beach (which is a beautiful public beach), outdoor table games (Ping Pong and Foosball) and a fitness center. The center also includes elliptical machines, upright bikes, circuit training, free weights and classes that range from yoga and meditation to Pilates and aqua aerobics. The large and luxurious locker facilities include spa areas with stone-clad steam rooms and red cedar saunas. Complimentary fruit and juice are available. Bike rentals are available through the Spa/Fitness Center desk for $10 per bike, per hour, including helmets and locks. Half-day rentals cost $30 and full-day rentals cost $60 per person. Choices include beach cruisers, mountain bikes, and children's bikes, including one with training wheels. If you need baby or toddler attachments, you'll be directed to a rental facility in town. Croquet, golf and tennis are available complimentary, with racquets and balls available. Lessons can be arranged through the Spa/Fitness Center. The hotel partners with Santa Barbara Fitness for a variety of water- and land-based adventures for beginners to advanced. Their certified guides bring paddleboards, kayaks, surf boards and bikes right to the hotel. Location takes on a whole new meaning for parents with stroller-age children, and the hotel's location offers long scenic strolls in spades. 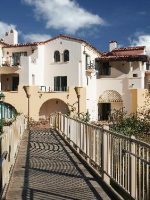 No short sidewalks or walking around parking lots here -- head out the front door and go right to stroll along the oceanfront for a few miles toward Santa Barbara's waterfront parks and enjoy views of surf, mountains, coastal mansions and more. 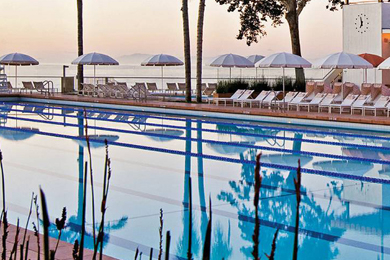 Or, take a left for a five- to 10-minute walk to Montecito's cafes and boutique shops. The resort's main restaurant features Italian-inspired California cuisine in a beautiful -- but casual enough for kids -- seaside setting. This indoor/outdoor restaurant has a hand-carved wine wall, rich mahogany and marble, rattan furnishings, a few large round tables for big families, and a heated outdoor terrace. Bella Vista serves breakfast, brunch, lunch, afternoon tea, and dinner. The extensive buffet breakfast, with an array of delicious options all beautifully presented, includes Monte-Cristo sandwiches, crab Eggs Benedict, cooked-to-order omelets with a huge choice of veggies and meats, cheese boards, pastries, breads, house-made salsa and Tabasco sauce, and even flax and hemp seeds to sprinkle on yogurt or pancakes. The breakfast buffet is $32 for adults and $16 for kids age 12 and under. Lunch and dinner menus include vegetarian and gluten-free options, as well as organic chicken, grilled Mahi Mahi wrap, Lobster Radiatore, seabass, and Veal Scaloppine. The children's menu is divided into small and big "bambino" sections, with, for example, mini-pancakes, or one egg and bacon for small bambinos ($7), and waffles, French toast, pancake stacks, and two eggs with side choices for bigger ones ($10 to $11). Lunch and dinner choices include chicken tenders, grilled cheese, macaroni and cheese and chicken noodle soup, as well as fruit cups, and cucumber and carrot slices. Root beer floats, triple-diple brownies, and a monster chocolate chip cookie are a big hit with kids. High chairs and crayons are available, along with an activity booklet that appeals to all ages with coloring pages, a maze and a word search centered on Santa Barbara (think words like skateboard, surfing and Butterfly Beach). Located across the street from the main resort and inside the Coral Casino Beach and Cabana Club, Tydes' oceanfront location offers panoramic views of the Pacific Ocean, Channel Islands and the Santa Barbara coastline. The restaurant has a 1930's Art Deco feel and Scandinavian style furniture both inside and out. Menus change seasonally and incorporate ingredients from local farms and fishermen. Tydes is open to all resort guests for dinner. Coral Casino entrance fees are applicable during lunch for guests in Superior and Deluxe rooms. Also located in the Coral Casino Beach and Cabana Club is the place for casual poolside dining and drink service, 11:30 a.m. to 5 p.m. (with club access). Menu favorites include a Seafood Cobb Salad, Mahi Mahi Fish Taco Wrap and Crab BLT, plus burgers, salads and sandwiches. This recently remodeled lounge has a Moroccan feel with dark woods, a fireplace and chandeliers in bold reds and oranges. The space definitely has an adult feel, however, kids will love the gilded framed mirror that is actually a large TV. The outdoor terrace is adjacent to Bella Vista and offers the same sweeping coastal views. The lounge is known for its' classic cocktails, Spanish tapas and wine selection, which ranges from local vintages to Spanish wines. Open 4 to 11 p.m. on weekdays, Fridays from 2 p.m. to 1 a.m., and Saturdays from 11 a.m. to 1 a.m.
Don't miss happy hour specials, available Monday to Thursday from 4 to 6 p.m., when cocktails are $7, wines $6, and featured tapas are $5 to $9. You'll find live entertainment on Wednesday, Friday and Saturday nights that range from velvety jazz to Spanish guitar, and a DJ on Saturday nights. Open from 7:30 to 11:30 a.m. and located at the Coral Casino Beach and Cabana Club, Fins is an organic juice bar that serves up made-to-order concoctions. Enjoy Greek yogurt, protein bars, baked goods and espresso drinks here, too. Gluten-free options are also available. Little ones receive a small Beanie Baby at check-in. Kids ages 4 to 9 receive an organic fruit roll-up, gummy bears, Honest Kids juice, and sand bucket toys, and 'tweens and teens ages 10 to 16 receive a Four Seasons beach bag (that converts to a mat) filled with treats and bottled water. Laundry and dry cleaning services are available. Pricing ranges from $2 to 16 per item for laundry and $9 to 19 for dry cleaning. The best deal is the same-day "Clean Departure" -- fill up a laundry bag with all you can fit and for $25, they'll wash, dry and fold your laundry so you don't have to when you get home. The stuffed toys that launched a craze and helped create Beanie Babies founder Ty Warner's fortune can be found in the lobby gift shop. In addition to Ty brand toys, the shop sells children's books and toys that range from how to make a balloon animal kitto little cars topped with mini surfboards, plus big bags of Gummy Bear treats, candy, clothing, swim wear, sunglasses and toiletries. Provided by the outside agency Mommy's Day Off, babysitting services are available with at least a one-day notice. Room-service treats are on another level here. Order the small chest of tortillas with guacamole dip, or a tray of chocolate covered bananas with sprinkles and delicious chocolate bark stuffed with nuts. The spa offers a booklet's worth of treatment options that include everything from manicures for tots, to specialty teen facials, a "Gentleman's Back & Shoulders Deep Cleansing," and several facials and massages (the latter range in price from $100 to $350). Treat yourself and your 'tween or teen (age 12 and over) to the two-plus-hour "Girl's Day Out" package for a 50-minute facial or massage, along with a spa manicure and pedicure ($285 per person). Note: A parent is required to be present throughout the treatment for kids between 12 and 15 for facial treatments, and for children under 18 for any massage or body treatment. The 25-minute "Little Hands" manicure and "Little Feet" pedicure is for kids age 12 and under, and includes nail shaping, a massage (hands or feet) and polish ($35-50). 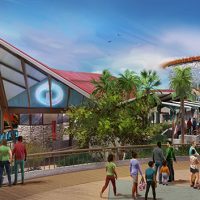 Similar to the pool situation, there are two fitness centers. The resort's fitness center, located across from the Resort Jungle Pool and adjacent to the spa, has floor-to-ceiling windows and is stocked with treadmills, exercise bikes, circuit training equipment and free weights. The center located at Coral Casino Beach and Cabana Club features Precor and Life Fitness equipment, circuit training machine, stationary bikes, exercise balls and mats and fitness classes, all overlooking the ocean. Slow season is November through February, with high season July through August, and shoulder season March through June and September through October. Average temperatures are the warmest in July and August, in the 70's. December and January are the coolest months with highs in the low-to-mid 60's and lows around 40. February is typically the wettest month. 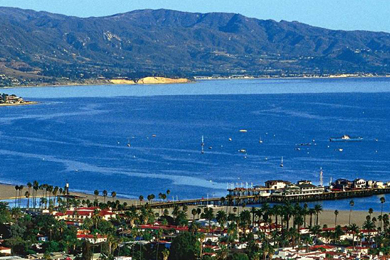 Santa Barbara Municipal Airport is 12 miles (20 minutes) from the resort and accessible by taxi or rental car. A taxi is approximately $60. Parking for a rental car is $35 per night for valet and $19 per night for self-parking. Depending on your departure city, Los Angeles International Airport might be a more affordable option, and worth the longer drive: 93 miles and just under two hours. Tip: Book an arrival time that helps you avoid LA's morning and late afternoon/evening rush hour traffic. 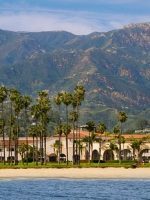 It's possible to have a great vacation in Santa Barbara without a car if you walk, bike and take cabs in and around Montecito and Santa Barbara, but a car is quite handy for exploring beaches and theme parks farther from the resort, especially if you have car-seat age children. A complimentary shuttle operates year-round on Saturdays and Sundays (10 a.m. to 4 p.m.), from the resort to mid State Street downtown, dropping off near Saks Fifth Avenue. The spa's treatment rooms offer so much more than treatments. They are huge suites complete with a fireplace, their own full bathroom, and seating so comfortable you'll want extra time just to relax with tea (or a drink) and enjoy the ocean breeze through your terrace doors. Massage choices include Shiatsu, deep tissue, Swedish and maternity, each for 50 or 80 minutes. Or, book the "Couples Suite Retreat" for a 25-minute soak, 80-minute massage, champagne and chocolate covered strawberries.